Yesterday Nanseikan hosted members of the Benalla Renshinkan for a mini seminar. I thought it would be good to jot down some notes of the main points that were covered. Efficiency comes when you learn to be relaxed. 1000 suburi helps to teach your body efficiency because you're too tired to overwork each movement. You learn to do just enough with nothing extra. Left-hand only suburi is crucial to teach your left arm to be the "power arm". The left is the engine, the right is the steering wheel. If you finish your cut with a bent left elbow it shows that you are using your right arm to power the cut. Ki ken tai itchi can be taught in a variety of ways. But overall the aim of being able to co-ordinate your movements to happen together is more important than cutting quickly or leaping a long way. Achieving correct KKTI has a lot to do with the left leg. The left leg kicks off (fumikiri) and provides the drive for your forward movement. Not just the leg but all the way down to your toes you push off and drive forwards. The right leg is little more than a prop. The angle of the right leg hardly changes throughout this action of fumikomi (stomping step). Also you should not raise your right knee at all. Think more of floating your right foot forwards, rather than lifting. Unweight it by falling forwards. See this post for a more detailed description. Renshinkan members tend to have shortened kiai and this often leads to weak zanshin. Always have a long kiai such as "ME~~~~~~~NNNN!" that carries you past your opponent. Article 12 in the Rules for Shiai and Shinpan give the definition of yuko datotsu (correct method of striking). The four requirements for a winning cut are: 1) use of correct part of shinai, 2) striking the correct part of the opponent's bogu, 3) delivered with correct posture and in high spirits, and 4) showing zanshin. As Tony said, you cannot add zanshin on after your cut. Zanshin is part of your intention from the beginning. Therefore all your attacks —both successful and unsuccessful—should show zanshin. You cannot attack an opponent who is ready. Study the concepts on attacking opportunities that are illustrated in the above diagram. This diagram is not definitive, it is just my own (poor) understanding. When you cease to just attack willy-nilly but start to examine your opponents and consider these concepts in order to apply them in your own Kendo, this is when you will have really started to grasp the essence of Kendo. It will take you the next 50 years to master this. Basics things to remember about shiai: 1) no signal to start from shinpan: both shiaisha should see when the shinpan are ready and then they agree to step in and bow simultaneously. This is where they make a connection (en 縁)。This connection is a unique and very important part of Kendo competition. In fact this character, 縁, means not only connection but also destiny, karma; 2) don't say "onegaishimasu" or "arigato gozaimasu" when bowing, 3) the command "hajime" is given by the shushin when the two shiaisha are in sonkyo, 4) You cannot expect to win the point if you yourself don't believe it was a valid technique, 5) Shinpan will always make mistakes, but because they are shinpan they are never wrong. 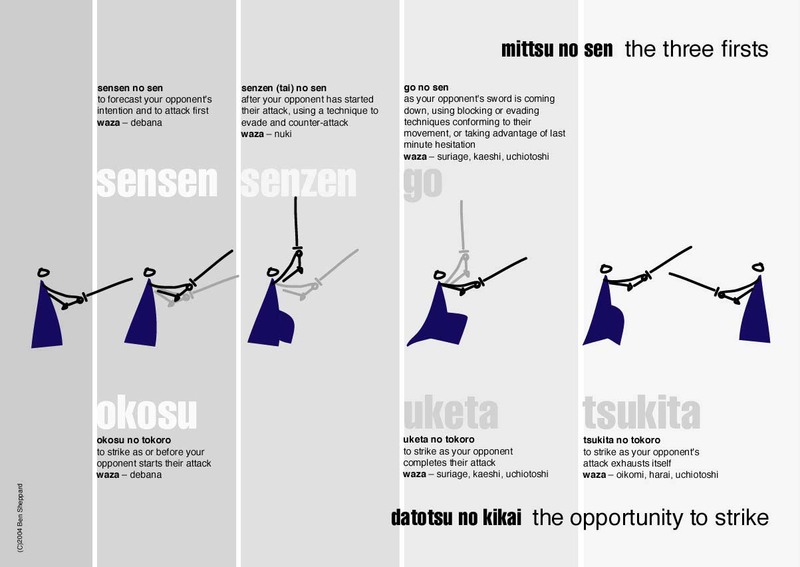 This is part of Kendo's essence as Budo and what makes it different to sport. This is not everything that we covered, so if there is something you remember, or if there are things that you have questions about, please leave a comment.